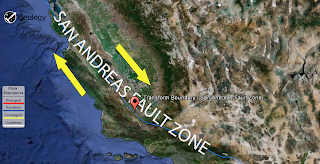 The San Andreas Fault can be divided into three segments. The southern segment (known as the Mojave segment) begins near Bombay Beach, California. Box Canyon, near the Salton Sea, contains upturned strata resulting from that section of the fault. The fault then runs along the southern base of the San Bernardino Mountains, crosses through the Cajon Pass and continues to run northwest along the northern base of the San Gabriel Mountains. These mountains are a result of movement along the San Andreas Fault and are commonly called the Transverse Range. In Palmdale, a portion of the fault is easily examined as a roadcut for the Antelope Valley Freeway runs directly through it. After crossing through Frazier Park, the fault begins to bend northward. This area is referred to as the “Big Bend” and is thought to be where the fault locks up in Southern California as the plates try to move past each other. This section of the fault has an earthquake-recurrence interval of roughly 140–160 years. Northwest of Frazier Park, the fault runs through the Carrizo Plain, a long, treeless plain within which much of the fault is plainly visible. The Elkhorn Scarp defines the fault trace along much of its length within the plain. The central segment of the San Andreas fault runs in a northwestern direction from Parkfield to Hollister. While the southern section of the fault and the parts through Parkfield experience earthquakes, the rest of the central section of the fault exhibits a phenomenon called aseismic creep, where the fault slips continuously without causing earthquakes. The northern segment of the fault runs from Hollister, through the Santa Cruz Mountains, epicenter of the 1989 Loma Prieta earthquake, then on up the San Francisco Peninsula, where it was first identified by Professor Lawson in 1895, then offshore at Daly City near Mussel Rock. This is the approximate location of the epicenter of the 1906 San Francisco earthquake. The fault returns onshore at Bolinas Lagoon just north of Stinson Beach in Marin County. It returns underwater through the linear trough of Tomales Bay which separates the Point Reyes Peninsula from the mainland, runs just east of the Bodega Heads through Bodega Bay and back underwater, returning onshore at Fort Ross. (In this region around the San Francisco Bay Area several significant “sister faults” run more-or-less parallel, and each of these can create significantly destructive earthquakes.) From Fort Ross the northern segment continues overland, forming in part a linear valley through which the Gualala River flows. It goes back offshore at Point Arena. After that, it runs underwater along the coast until it nears Cape Mendocino, where it begins to bend to the west, terminating at the Mendocino Triple Junction. The evolution of the San Andreas dates back to the mid Cenozoic, to about 30 Mya (million years ago). At this time, a spreading center between the Pacific Plate and the Farallon Plate (which is now mostly subducted, with remnants including the Juan de Fuca Plate, Rivera Plate, Cocos Plate, and the Nazca Plate) was beginning to interact with the subduction zone off the western coast of North America. The relative motion between the Pacific and North American Plates was different from the relative motion between the Farallon and North American Plates, so when the spreading ridge was ‘subducted’, a new relative motion caused a new style of deformation. 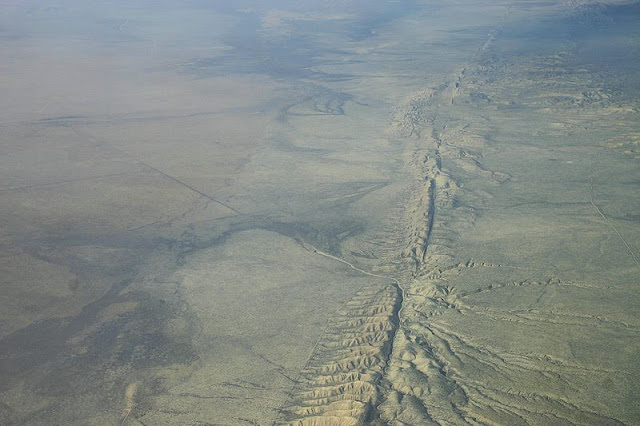 This style is chiefly the San Andreas Fault, but also includes a possible driver for the deformation of the Basin and Range, separation of Baja California, and rotation of the Transverse Range. The San Andreas Fault proper, at least the Southern Segment, has only existed for about 5 million years. The first known incarnation of the southern part of the fault was Clemens Well-Fenner-San Francisquito fault zone around 22–13 Ma. This system added the San Gabriel Fault as a primary focus of movement between 10–5 Ma. Currently, it is believed that the modern San Andreas will eventually transfer its motion toward a fault within the Eastern California Shear Zone. This complicated evolution, especially along the southern segment, is mostly caused by either the “Big Bend” and/or a difference in the motion vector between the plates and the trend of the fault(s). All land west of the fault on the Pacific Plate is moving slowly to the northwest while all land east of the fault is moving southwest (relatively southeast as measured at the fault) under the influence of plate tectonics. The rate of slippage averages approximately 33 to 37 millimetres (1.3 to 1.5 in) annually across California. The westward component of the motion of the North American Plate creates compressional forces which are expressed as uplift in the Coast Ranges. Likewise, the northwest motion of the Pacific Plate creates significant compressional forces where the North American Plate stands in its way, creating the Transverse Ranges in Southern California, and to a lesser, but still significant, extent the Santa Cruz Mountains, site of the Loma Prieta Earthquake of 1989.Studies of the relative motions of the Pacific and North American plates have shown that only about 75 percent of the motion can be accounted for in the movements of the San Andreas and its various branch faults. The rest of the motion has been found in an area east of the Sierra Nevada mountains called the Walker Lane or Eastern California Shear Zone. The reason for this is not as yet clear, although several hypotheses have been offered and research is ongoing. One hypothesis which gained some currency following the Landers Earthquake in 1992 is that the plate boundary may be shifting eastward, away from the San Andreas to the Walker Lane.Assuming the plate boundary does not change as hypothesized, projected motion indicates that the landmass west of the San Andreas Fault, including Los Angeles, will eventually slide past San Francisco, then continue northwestward toward the Aleutian Trench, over a period of perhaps twenty million years.